It’s hard to be in a bad mood in Paradise, but even in Hawaii a fine place to stay helps to maintain a traveler’s merry mood. 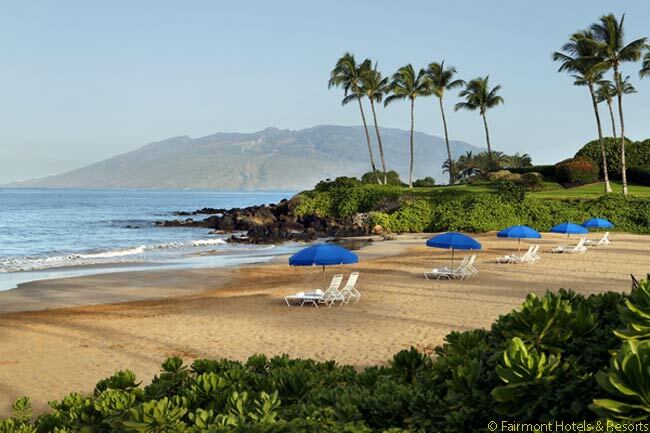 The Fairmont Kea Lani, a 5-star seaside property on the lovely isle of Maui, is such a place. 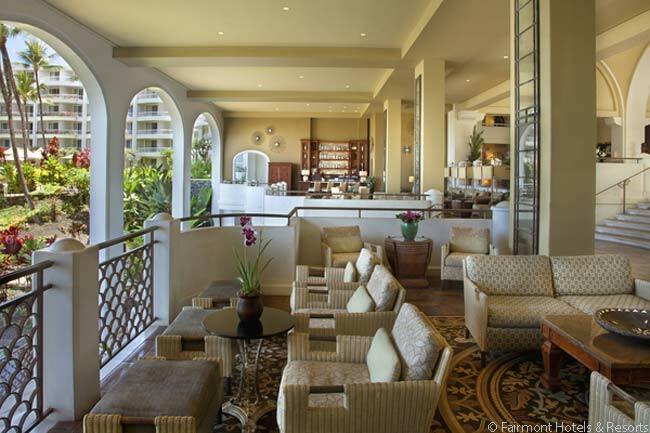 Operated by Toronto’s Fairmont Hotels & Resorts, the Kea Lani, located by the town of Wailea in southwest Maui, recently completed a multi-million dollar renovation of its two-decade-old main building. Additionally, the Kea Lani closed, upgraded and has reopened its fine-dining restaurant, Ko, transforming what had been a decent restaurant into a superb one. My wife and I stayed at the Kea Lani for four nights in early March, and I couldn’t help thinking how much better I felt there than when I first started visiting Hawaii. On early trips, I stayed in a wide range of lodgings. Among them: a guest dormitory on the University of Hawaii campus in Honolulu, where there was no air-conditioning to cool the tropical heat, and a ramshackle motel by Honolulu International Airport (IATA code HNL), where a noisy window-box air conditioner kept me up all night. This was not the case at the Kea Lani, where trade winds cooled the heat, and other pleasures of the Islands – surf, sun, sand, fresh fruit, fresh fish – augmented the comforts of the resort. The Kea Lani – which opened as a privately owned and operated hotel in 1991 – has 413 rooms. Every room in the landmark hotel is actually a one-bedroom suite. Outside, on the lush 22-acre grounds, stand 13 posh two- and three-bedroom villas. Brilliant hibiscus and bougainvillea grow amidst kelly-green grass, which additionally features small waterfalls and ponds. Cabanas set up under swaying coconut palms at the beach are perfect for a massage. Wriggling your toes in the sand and reading, as we did, isn’t too shabby either. The Kea Lani has a distinctive, entirely white exterior (“kea lani” means “heavenly white” in Hawaiian). The hotel’s design, by Spanish architect Jose Luis Ezquerra, has distinctly Moorish-inspired arches and balconies. 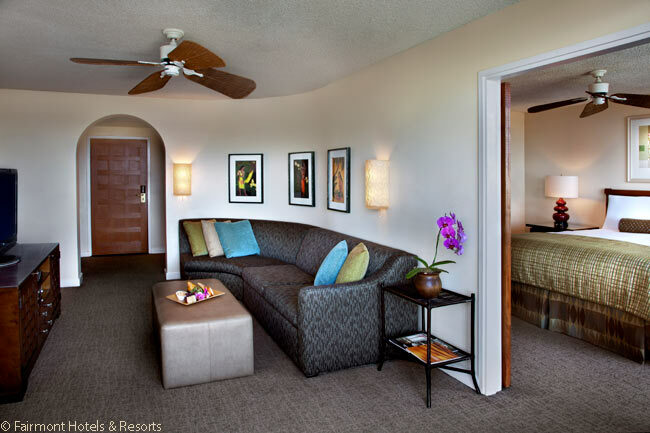 Regardless of architectural provenance, the Kea Lani is eye-catching, with many delightful elements. Parts of the main lobby near the reception desk are ‘wall-less’: left open to the caressing trades – a popular style in Hawaii. When we checked in, eddies of fragrant blossoms swirled prettily around and through the expansive lobby and across its gleaming marble floors. On the oceanward side of the lobby open-air seating overlooks the grounds. This is the Luana Lounge, a popular gathering spot for holiday-makers, honeymooners and business travelers on-site for retreats and conferences in the resort’s 30,000 square feet of meeting space. 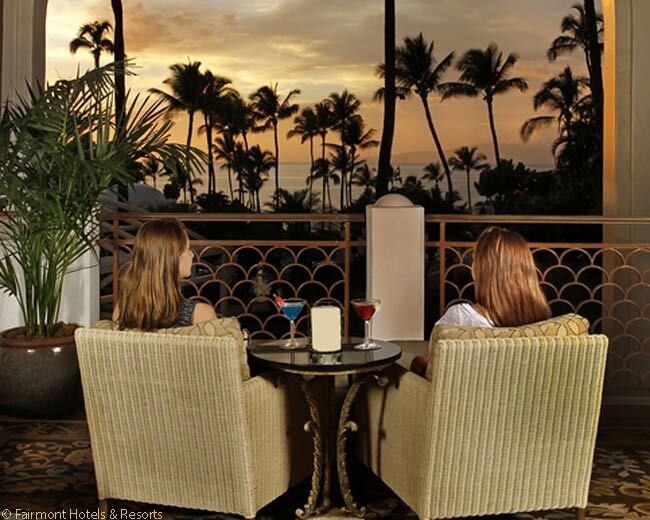 The Luana Lounge is also a relaxing place to watch the sun sink into the Pacific Ocean, drink in hand, and listen to live guitarists and singers strum pop tunes and croon falsetto Hawaiian ballads. We stayed in a one-bedroom suite on the Fairmont Gold executive floor. The Fairmont Gold floor features a handsome, staffed guest lounge, open from 6:30 a.m. to 10 p.m. daily. The lounge has lanais (outside balconies), a breakfast buffet, tea and good-quality coffee and snacks in the afternoon and drinks at an honor bar in the evening. Three free PC work-stations also grace the Fairmont Gold floor. An attentive Fairmont Gold staff is on-call to make restaurant reservations, give travel advice and driving directions, check you in and check you out. 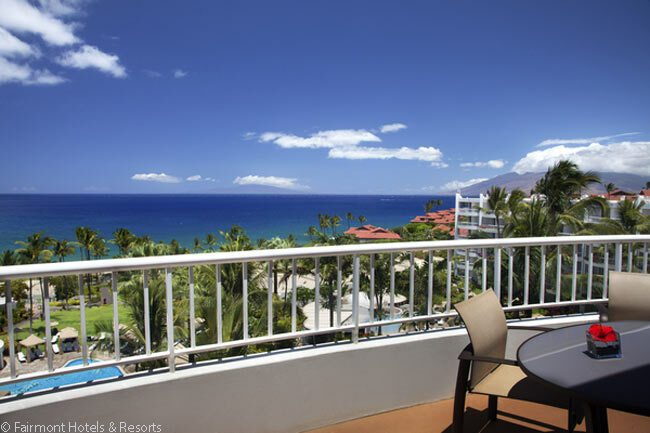 We also had a Sunnyside Breakfast Package for two, for the spacious, open-air Kea Lani Restaurant downstairs. There is a sumptuous breakfast buffet there, complete with fresh-made omelets. Our well-appointed suite was on the same floor as the Fairmont Gold lounge and a 90-second stroll away. It, too, had a lanai, which made the 850-square-foot suite feel even bigger. The marble-floored bathroom held a deep bathtub, a good separate shower and two pedestal sinks. The suite also had a mini-refrigerator. There was a flat-screen TV in the bedroom and another in the living room. Most importantly, the bed was well-balanced between soft and firm, and had plenty of room. 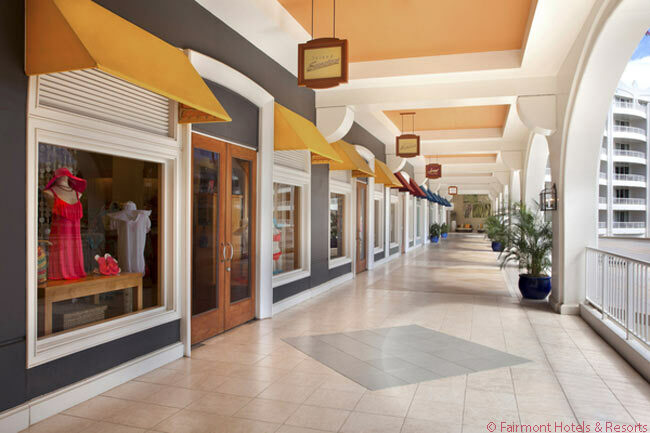 On the lower floors, the Kea Lani has all the amenities you’d expect of a deluxe resort: a 24-hour fitness center; a spa (soon to be expanded); a business center; a real estate office; four restaurants; a deli/bakery; local vendors selling crafts; and a line of shops which offer aloha shirts and other souvenirs. 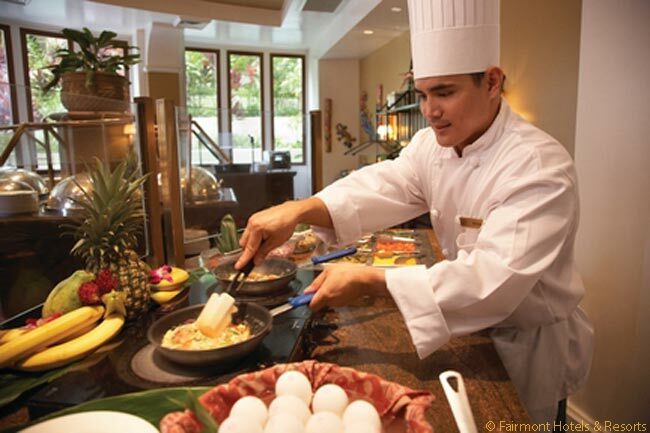 One of the Kea Lani’s more educational offerings is its Hawaiian cultural program, run full-time by a staffer who specializes in traditional Hawaiian culture. 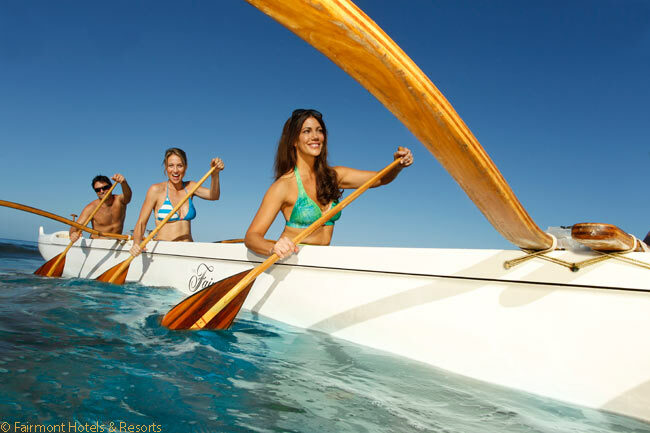 Outrigger canoeing, exploring the area near the hotel and explaining the uses of Maui plants are among the cultural activities, all of them complimentary. The aforementioned restaurant Ko is a must-do. Ko (‘sugar cane’ in Hawaiian) specializes in the wonderfully eclectic food of the old Hawaii sugar and pineapple plantations, updated for contemporary tastes by a gifted chef, Tylun Pang. This is a flavorful, fresh, hearty cuisine that draws on cultural strands that make up modern Hawaii: Portuguese, Filipino, Japanese, Chinese and Korean among them. Ko is especially good at preparing fish, some pulled from the waters off Hawaii. We dined outdoors at Ko on our last night; it was the perfect place to say “aloha”. 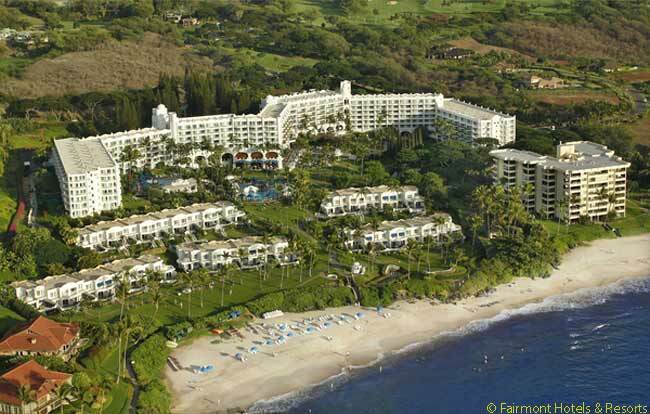 The Fairmont Kea Lani is located at 4100 Wailea Alanui Drive, Wailea, Maui, HI 96753, 17 miles from Kahului Airport off Highway 31. 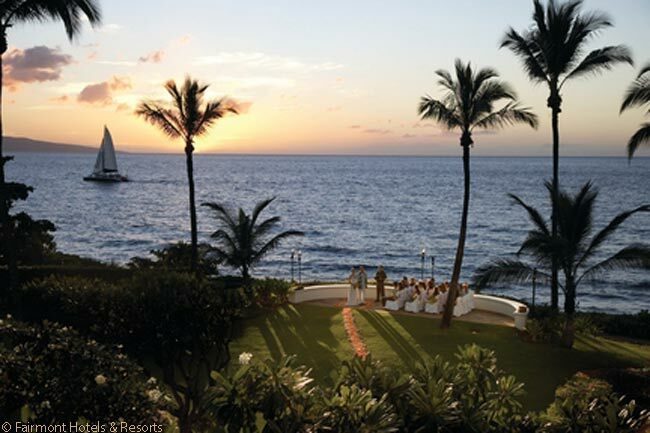 To find out more information and to book, call (866) 540-4456 toll-free; or send an e-mail to info (at) kealani.com; or visit www.fairmont.com/kea-lani-maui. Rooms start at $636 a night.